My Creative Space is quite high flying today so make sure you have your best designer duds on before you read it ok? Hang on, I have to change to a posher font. OK. 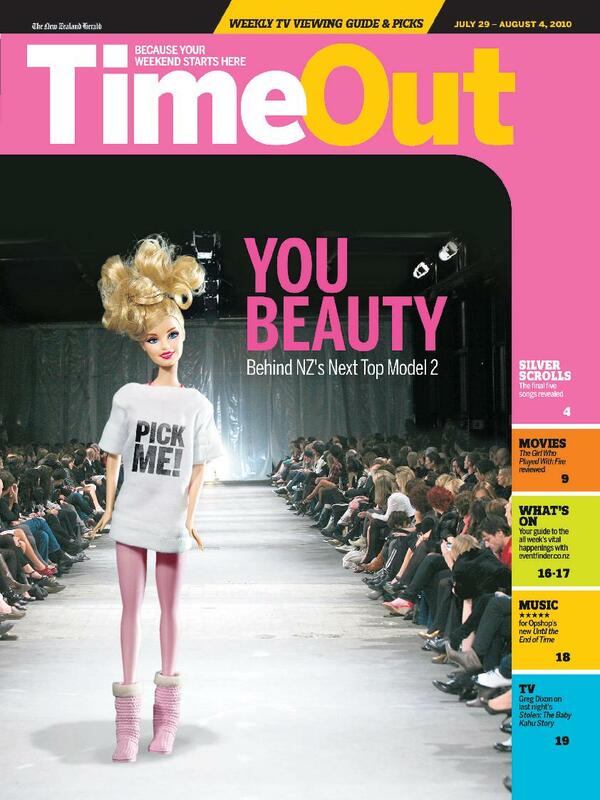 I designed and made the outfit worn by the catwalk model on the front page of today's New Zealand Herald Time Out entertainment guide. OK, so I'm starting small and the fame won't change me. Seriously though, have you any idea how bloomin' difficult it is to set in sleeves on a t-shirt that small?! For more Creative Spaces, pop over to Kootoyoo . That looks fab with the boots as well! Clever you! Must have been very fiddly, making something that small! Hehe, I love it. And I think you've done a fabulous job!! Wow! That would have been difficult. Your model looks happy with your work! Brilliant job. You rock star you!!!! She looks fantastic! Love it! Are you making big ones to match!? Haha, it´s fantastic! I agree with imba, will you make big ones too? mwahahaha - good job ;o) Hand sew or machine? That's fantastic!! I love it. hehehe that is freaking AWSOME!!! congrats! Wow. The smaller the outfit the harder to sew!! 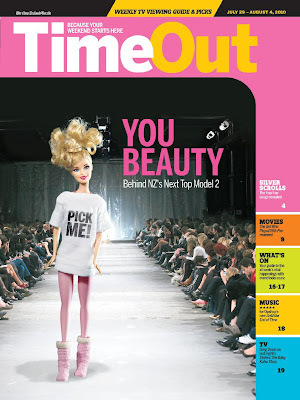 funny...i did doll clothes last week so i do! I love it! Clever you, I can imagine how fidly something so small must be! daaahling! you have all the right contacts! and (sewing) skills. That's hysterical. She looks like she's just rolled out of her 5cm bed with hair like that. Love the shirt - reminds me of the old "Choose Life" hypercolour shirts from the 80's! Oh, they were the good ol days!